The h323.conf just defines the link between the Avaya and the Asterisk server. 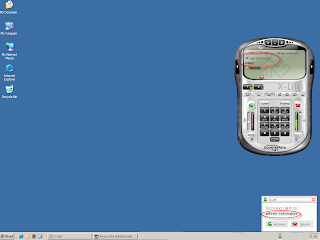 On sip.conf I set two demo extensions 89301 and 89300. This are numbers similar to my Avaya extension range and they also match a DDI range. On extensions.con I set up a basic dial plan to send sip calls to each sip phone and calls from the sip phones to the Avaya system. ;Simple rule to divert all calls from Sip extensions to Avaya extensions and External numbers on PSTN. a. On system-parameters customer-options in the second page you must have enough Maximum Administered H.323 Trunks to use. b. A CLAN to use. b. A MEDPRO to use. Note that my Avaya PBX is a CM version 3.1.2, there might be other requirements that I might be missing. 2) Below are the details of my CLAN, note the network region defined. In this case 6.
d) Now you have to define the IP Trunk and IP Signaling group. You have to create both on sync, below just the final output. Note that the Supplementary Service Protocol needs to be set to "a" to allow the passing of call info (extension number, name, etc) from and to the two systems. This will be shown at the end of this post in an Avaya to Asterisk extension call. 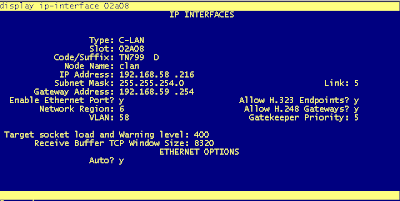 e) At this stage you should have the H323 IP trunk up and running between the two systems. You might require a busyout of signalig group/trunk to bring it up. f) The next step is to define the routing off calls from the Avaya to the Asterisk box using the new trunk created. First I set up on the uniform-dial-plan that all my extensions begining wiht 893xx and 5 digits should use the ARS table. My Avaya dial plan is of 5 digits, and I do an inc-call-handling-trmt to change external DDI to an internal extension. For example 02070189301 is set to the internal number 89301, note that 89301 is NOT an extension that is defined on the Avaya system. 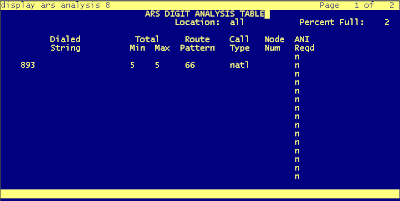 Then on the ARS analysis table I defined that the 893xx range should use the route pattern 66. (not sure which call type I have to use, on my test the last one was natl therefore it was left like that). Finally the route-pattern 66 is defined using the trunk 66 previously created and that would be all the configuration needed. One final step that I had to do was to complete my public-unknown-numbering table. I found on the test that while the extension name was sent to the asterisk server the extension name was not. External calls to the DDI worked fine and the caller number was passed but when calling from an internal extension there was a problem. After googling and checking this I found that by setting the first digits of my Avaya extensions and the trunk all the Avaya extensions sent the number to the Asterisk server and were display on the IPSoftphone being used for testing. You can see on the result that the name and the extension number is sent to Asterisk. This is due using Supplementary Service Protocol a on the second page of the trunk 66 definition as mentioned before. Im trie. One year ago and realy work. With this change you can send number from asterisk. Thanks for this entry! Helped me getting started on the Topic Asterisk/H323 trunks. Excellent post. About to face interfacing VRU applications in Asterisk with Avaya and will be back here reading again. Do you happen to know if UCID (generated in Avaya before call sent to Asterisk) is made available over H323 and available in the DialPlan? Or will Avaya CTI solutions such as JTAPI/CTAPI come in to play at that point? Story with a Prologix Avaya version V11, also works for this type of model for Avaya? Thanks for the help. Using this configuration Iam able to achieve the calling from avaya extension to asterisk extension but vice versa is not working i.e Iam unable to call from Asterisk extension to Avaya Extension. What could be the probable changes which I need to follow in order to achieve the calling from Asterisk extension to Avaya Extension ? Pls help me with the solution. what i i was to do the same on elastix... which files i will be edtings then??? as in elastix its writen in file that do not EDIT files..
Hi. Excelent guide. I got it working with the latest Elastix version to Avaya Definity. All is working well, the only thing i cant get to work is the dmtf tones. We have Authorization codes in avaya to allow external calls to users, and when a user using a SIP phone tries to make an external call, the avaya system is waiting for the authorization code, the user dials the code but Avaya doesnt recieve it. Any ideas? Thanks! Hi Mr. Ramirez, have you already figured out the solution on this authorization code problem? I too is experiencing this.